Here's an effect that I use quite often with my own photos to bring more attention to the main subject of an image or just to give photos a little more warmth and personality. Once you see how easy it is to create, I think you'll find yourself using it as much as I do. We're going to learn how to darken or burn the edges of a photo, creating a vignette effect, and we're actually going to create the effect using a filter in Photoshop that was designed to remove such a "problem" from an image. In Photoshop CS2 (you'll need Photoshop CS2 or later to complete this tutorial), Adobe introduced us to the Lens Correction filter. This filter's main purpose is to help us remove common problems that can be created by camera lenses, such as barrel distortions, chromatic aberration and vignetting. It's a great addition to Photoshop's ever growing collection of photo editing tools, but there's no rule that says you have to use Photoshop the way the folks at Adobe intended. As we'll see, the same filter designed to remove dark edges from a photo also happens to be a great way to add them! The final "darken photo edges" effect. The Layers palette now shows a copy of the Background layer sitting above the original. Go to Filter > Distort > Lens Correction. This brings up the rather massive Lens Correction dialog box which may look confusing if you've never used it before, but don't worry. For this effect, we only need to use a couple of the options found here. Deselect the "Show Grid" option to turn off the grid in the preview area of the dialog box. Most of the options for the Lens Correction filter are found in a column along the right side of the dialog box, and if you look closely, you'll see that the options are divided into various groups. You can safely ignore most of the options found here because there's only two of them that we need for darkening the edges of our photo and both are found in the Vignette group. Normally, these two options are used to remove unwanted vignetting caused by a camera lens, but we're going to use them to darken the edges of our photo. 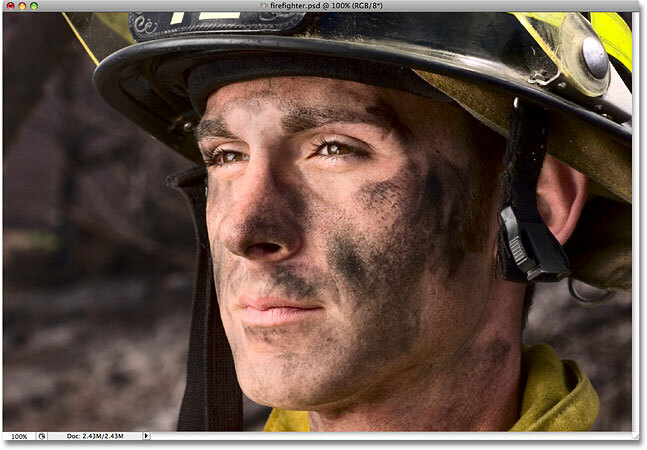 Drag the Vignette Amount slider to the left to darken the photo edges. The edges of the photo now appear much darker. The Midpoint slider determines how far in towards the center of the image the darkening will extend. More of the background around the firefighter's face is now affected by the edge darkening effect. Lower the opacity of the layer to lighten the edges if they appear too dark. And there we have it! That's how to create a darkened photo edges effect with Photoshop! Visit our Photo Effects section for more Photoshop effects tutorials!